Basic Jam needs 3 ingredients – pectin, sugar and acid. Fruit naturally contains pectin, a jelling agent, which varies from fruit to fruit. 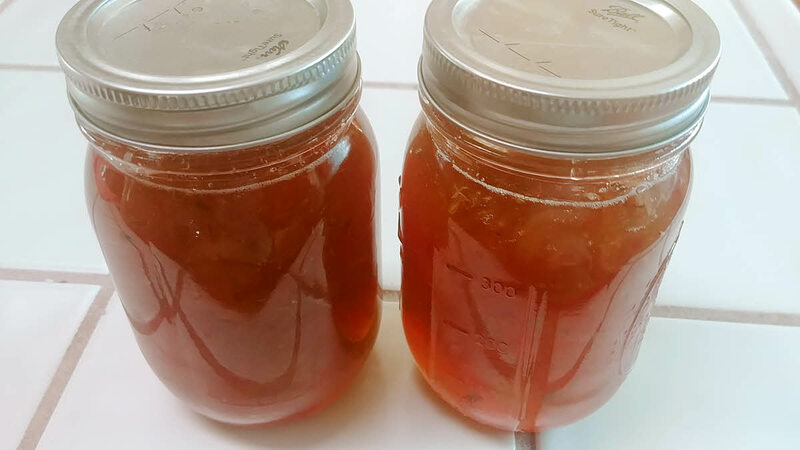 If you are making jam with low pectin fruit, you can combine them with a high pectin fruit. For each 500 gm of low pectin fruit, use 1 large unpeeled apple. Cut the apple including the core into 1 inch pieces, place on a cheesecloth, bring up the corners and tie them up firmly. Cook the apple along with the fruit and discard the cheesecloth bundle before ladling the jam in jars. Wash jars and their lids in warm soapy water and rinse thoroughly. To sterilize the jars, pour about 1.5 inches of water in a big pot and place the jars and lids in the water and boil for 15 minutes. Take them out and set aside on a clean surface. Wash the fruit and remove any dirt, leaves or stems. Cut it in 1 inch pieces. Combine fruit, sugar and lemon juice in a non reactive pot. Make sure that there is at least 3 inch of space above the fruit. If you are using a drier fruit like apricot, add 1/2 cup of water per 500 gm of fruit. Cook over medium heat, stirring till the fruit starts to release its juice and sugar starts to dissolve. Raise the heat to high and continue to cook, stirring often. When foam starts to gather on top, skim it off. The jam will bubble vigorously in the beginning and more slowly later. When jam reaches 220 to 222 degrees Fahrenheit, turn off the heat and wait for few minutes for it to cool down a bit. If jam is poured immediately, fruit pieces will float on top. The temperature is same for all fruits ie 221 degrees Fahrenheit at sea level. For every 1000 feet above sea level, subtract 2 degrees. Slowly ladle the jam in the jars leaving 1/8 inch on the top. Remove any drips with a clean towel. Top with lid and seal with screw band. Place a wire rack in the same water pot as before and place the jars on it upright. Close the lid of the pot and boil for 5 minutes till 3000 feet, 10 minutes till 6000 feet and 15 minutes till 8000 feet. After boiling, take them out and let them cool. While the jars cool, the lids will make a popping sound as they contract. This indicates that you have a good seal. Basic Jam is ready. If the jars are sealed properly, they can stay in pantry for 1 year otherwise, they can be stored in refrigerator for up to 6 weeks.